If you’ve ever gone on holiday via the South Western Highway, you have driven over the last resting place of Pinjarra’s earliest settlers. According to Tobe Hooper’s 1982 documentary, Poltergeist, it is very dangerous to build on top of graveyards without moving the bodies first. And yet this is exactly what Main Roads did in 1954. There have been a number of bridges crossing the Murray at Pinjarra, of which the 1897 one was falling down some fifty years later. It had been designed for the horse and buggy era and couldn’t cope with modern transport. Many of the piles had rotted and engineers were amazed the whole thing had not collapsed. Although when it swayed alarmingly as stringers were removed, the workmen had to scurry to safety. The new bridge (which is still there) was also timber, and overshadows the tiny church of St John next door. Here many of Pinjarra’s white pioneers lay buried. But to make way for the new bridge, Main Roads needed a portion of the churchyard. Presumably to save money, they simply dug up the gravestones, rested them against the church and built a new road over the top of the graves. Is that really how we treat the deceased in Western Australia? There were certainly local signs this was not a good idea. 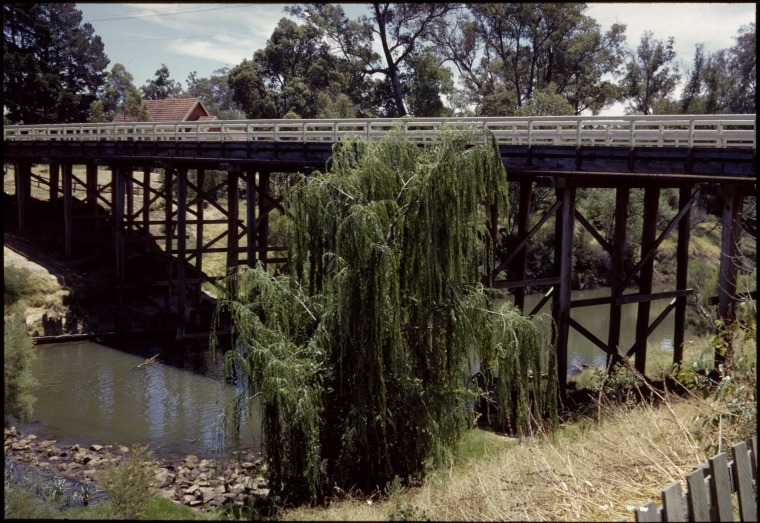 An earlier bridge over the Murray had been haunted in the 1870s by the spirit of a local lady, known to us only as Aunt C.
We warn Main Roads what happens in history once—in Poltergeist—could easily happen again. For the sake of our flaxen-haired little girls, please Main Roads do something before They’re Heeeere for good.